with A DAY IN THE LIFE (#39). Hi, my name is Phyllis and I am a 'closet' Xena watcher. Yes, I admit I am hooked and hooked bad. I found Xena: Warrior Princess quite by accident, about halfway through the second season. The first episode I saw was A DAY IN THE LIFE (#39). That is all it took. Now that I have made my confession to the horde (not the horde -- unless you all have had your noses pierced) and masses, I hope it will counteract all the weird 'stuff' that has been happening to me over the last few months. Call it XWS [Xena Withdrawal Syndrome], subliminal suggestion, overactive imagination, mental instability, or call it mischief of the Gods. I do not know. I found Xena one Thursday night (I remember quite clearly it was a cold night in February) while flipping aimlessly through the channels. Watching a female warrior beating the daylights out of a bunch of bad guys with a frying pan was, well, let's just say it piqued my interest. I put the remote down and settled in for what I thought would be an hour of mindless action entertainment. By the time the show was over I was rolling with laughter. The writing was incredible, surpassed only by the superb acting/comic timing (rapport) of the two leads. It was so obvious that they (Lucy Lawless and Renee O'Connor) seemed to be having just as good of a time making this as I was having watching it. I would definitely be back next week (and, it seems, the week after that and so on and so on...). I really did not start out to be a 'closet' watcher. I tried to be upfront about it. I mentioned the show at work and to friends, only to be met with blank stares and worse. They ridiculed me, they called it hokey, kid oriented, silly nonsense --- they asked how I could possibly watch that 'junk'. For weeks, I valiantly tried to explain its appeal. I discussed the shows/episodes, the important lessons/themes, the comedy/drama, the action/special effects and the wonderful characters and friendships portrayed. But noooooo! They all continued to laugh and mock me. They then began to refer to me as the 'Warrior Nutcase'. So, that was it! I vowed to myself, not to discuss it again with any of my 'so-called' friends. I would just quietly feed my Xena need in silence and solitude. Little did I know what chaos would ensue. It wasn't long after this decision, that 'stuff' started happening. The season had ended and reruns set in. My subconscious brain began to work overtime by manifesting some very strange behaviors. Let's see, how best to describe it? Well, I call the behaviors: 'Xenaisms' and 'Gabriellines'. In short, XWP began to take over my life! One could say it started out rather innocently enough, just daydreams and fantasies. One day on my way to work, after being cut off in traffic by some yahoo in a pick-up truck (instead of my typical New Yorker born and raised reaction -- which usually involves screaming short words and showing off specific fingers), my first thought was getting my hands on this moron and applying a pressure pinch. The words "the blood to your brain has just been cut off...you will be dead in seconds..." kept running over and over in my head. I had been reading on the MCA NetForum about an affliction called Xena Withdrawal Syndrome (XWS) and since the season was now over -- I wrote this incident off as a daydream caused by XWS. 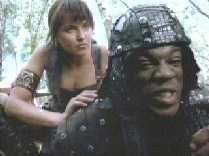 Xena rakes baddies, not leaves. Another day, while in the process of raking leaves in my backyard, I suddenly found myself beating the sap out of a 'warlord' pine tree with the rake handle. For awhile, I was winning! Bark was flying everywhere. Take that! Haha! And that! Hoho! But then the tree must have started fighting back or maybe it was the effects of whacking myself a few times in the head with my new-found staff. Anyway, I was brought back to reality rather quickly. After realizing what I must look like (and I did take a look around the yard to make sure no neighbors saw me), I sank to the ground in a laughing heap. I started to surmise something was amiss. Nah, it is merely heat stroke. Yes, that's it. Heatstroke. Later that same day, while playing fetch with my dog, I found myself trying to bounce the frisbee (a very well known/patented round throwing thing) off several objects in the yard in an effort to get it to return to me. I knew then I had to get out and stay out of the sun. Still denying to myself that my mental state was declining, I tried my best to proceed with my life and ignore these bizarre daydream/fantasy occurrences. I still hoped that they would eventually go away. To counteract what I was now convinced was XWS, I immersed myself in the NET -- I checked in daily with the MCA NetForum and regularly cruised other Xenaverse sites. Then I started having weekend Xenathons -- watching as many episode tapes as I could at one time (without sleeping -- looking back now, this was probably not a good move on my part). I continued to tenaciously collect anything Xenite in nature: pictures, photos, t-shirts, clothing, dolls, figures, posters, CDs, etc. I even found myself shopping for a sword and a chakram. But it did not work. Soon it got to the point where I would be driving along in my car, listening to the radio, hear a song and imagine scenes from the show that would fit the lyrics. My (hidden) obsession was not diminishing, it was growing! But I stashed all my Xenabilia in a footlocker, safe from the 'disbelievers'. So far, I was lucky, no one had seen any of this, I was still safe. So I thought. Then it got weirder. C'mon, admit it -- haven't you wanted to do this to your boss at least once? One day at work, after completing a rather Herculean task (where did that come from? Excuse me, Xenian task), I was queried by my boss as to how I managed to do it. "I have many skills," I heard a low voice say. This was followed by a quick look behind me -- yes, and the realization that it really did come from my mouth. Suddenly, I began to giggle (you know, the type that goes with an inside joke), then with the straightest face I could pull together (I admit it was smirky, at best), I said, "Hey, I'm Phyllis, I'm a problem solver." By now I was in hysterics, laughing. This completely weirded out my boss. As I walked off, wiping the tears from my eyes because I was laughing so hard, he just stood there, with this incredulous look on his face, shaking his head. Another day at work, I found myself defending a fellow employee with the words, "Whatever he did, I'm sure he didn't do it." This was met with blank stares all around. Now I knew it was going to take me forever to live down the 'Nutcase' nickname. I admit, it all still sounds harmless enough, but what if you add another symptom in, like a sudden desire for leather clothes. I live in Florida. I do not need a leather anything. (Thank the Gods, no one sells metal armor breast plates -- whoa, scary thought!) I have also given in to the urge to try fishing without a pole and I have had some success. Granted it was in my fishtank and all I actually acomplished was scaring the Hades out of my goldfish. But, I did manage to catch the little sucker! Oh, and talk about food cravings. Just show me some hard cheese, a loaf of bread or any kind of nutbread. But please, no pink jell-o. On the plus side, I have found that I love to walk and I have learned to appreciate nature. I have taught my dog to listen to whistle commands (but I suspect she is just doing this as a way of humoring me; after all, she was a witness at the tree beating incident). I have also become pretty adept at storytelling and can build a flying parchment with some degree of expertise. (Where's a giant when you want one?) I found that it is fairly easy to turn a simple block of cheese and a loaf of bread into a gourmet meal (fit for a Princess or Amazon Queen -- as the case may be). Also, I have not really wanted to toss any babies in the air, at least no more than I had before and (thank the Gods! ), I have no desire, whatsoever, to bungee jump over a lava pit, spit fire or inhabit someone else's body. I have not flung any frying pans at anyone lately and I have found that I still prefer verbal sparring to physical fighting. (As in, now you're gonna get it -- kiss your b*tt goodbye!). On me, though, a short, dark-eyed, mousy brown-haired me -- well, the look , in any of its varieties, just makes me appear psychotic. But hey, whatever works! It is still the same result. I get whatever I want -- now ! This particular manifestation, I have found, is not necessarily a bad thing. I think I can learn to live with this one! I am hoping with the new season about to arrive that most (if not all -- I will miss the power of the look ) of the weird manifestations will subside. But, I do not know. I do hope this serves as a warning to you all. Do not let this happen to you! Do not hide your obsession with the show. Rather, embrace it. Be proud of it. Tell everyone about Xena . Make them listen. Scream your support of XWP from the rooftops if necessary. On second thought, that last one might not be a good idea. Personally, I am trying to stay away from ladders and roofs and any high places -- one "YIYIYIYIYIYIYIYIYIIII!!!!" and backflip off. Well, I do not even want to think about it. I sure hope the new season gets here quickly! In the meantime, anyone know where I can find a blonde sidekick and a Chakram (not necessarily in that order)? A heroine, a sidekick, a quiet camp. What more to life *is* there? Author's Note:  No names were changed to protect the innocent (do you think I could make a name like that up?) and all events occurred as written. No living things were irrevocably harmed during the 'occurrences'. The pine tree had a bark graft and is recovering nicely and the goldfish and dog are in therapy (which is probably where the writer should be). Phyllis was born in 1961 (do the math yourself!) in Amityville, NY (insert your own favorite demon possession joke here) and now resides in NW Florida. She is a graduate of the Univ. of West Florida (GO ARGOS!) with a degree in Marketing. Phyllis wastes her days slaving away in Retail Management for America's second largest retail chain (and Rosie O'Donnell's biggest paycheck). This provides her with enough dinars to afford food & shelter and to keep her rapidly growing Xenabilia collection expanding at a phenomenal rate. She is thoroughly obsessed with XWP and continuously attempts to convert all 'disbelievers'. For this she has been rewarded with the nickname 'Warrior Nutcase'. When not watching her favorite episode tapes (the comedic ones, natch!) for the bazillionth time, she spends time outdoors with her 4 dogs or on her computer cruising the Xenaverse (at the Netforum, she is WarriorNutcase). Phyllis designs/creates puzzles for fun (one of which was posted online at ROC's Fan Club site a few months ago).